Relationship(s): brother of Lourdes Gurriel Jr.
Yuli and his wife, Lianet, reside in Miami, Fla. with their sons Yeremi and Jayden...Is the son of Cuban Serie Nacional star, Lourdes Gurriel, who managed Yulieski during his career in Cuba...is the brother of Yunieski Gurriel and Toronto Blue Jays infielder Lourdes Gurriel Jr., who both also played in the Serie Nacional...Internationally, played for the Cuban National Team, which won the gold medal in the 2004 Olympics and the silver in the 2008 Olympics...also represented Cuba in the 2006, 2009 and 2013 World Baseball Classics...was named to the 2006 World Baseball Classic All-Tournament Team...also played with the Cuban National Team in the Baseball World Cup, International Cup, Pan American Games and Central American and Caribbean Games...Was one of nine Cuban players signed or acquired by the Astros from 2015-16, joining OF Yordan Alvarez, RHP Rogelio Armenteros, OF Norberto Castellanos, CF Alejandro Garcia, LHP Cionel Perez, RHP Yoanys Quiala, SS Anibal Sierra and RHP Carlos Sierra...Became the eighth Cuban-born player (fourth position player) to play in the Majors with Houston... also: OF Roman Mejias (1962), LHP Mike Cuellar (1965-68), RHP Aurelio Monteagudo (1966), IF Marty Martinez (1969-71), OF Sandy Valdespino (1969), RHP Oscar Zamora (1978) and LHP Raul Valdes (2014)...Signed a five-year Major League free agent contract with Houston on July 16, 2016...his deal runs through the 2020 season. Set career highs in runs (70), walks (23) and RBI (85) in what was his second full Major League season...was named AL Player of the Week for the week of Sept. 16-23...showed his versatility, playing multiple positions around the diamond...played in 109 games at first base (99 starts), 21 games at third base (13 starts), 15 games at second base (11 starts) and two games at shortstop (1 start)...batted .403 (56x139) with runners in scoring position, the second-best mark in the Majors behind Joe Mauer (.407, 22x81)...set a new club record for batting average w/RISP in a single season, besting Jose Cruz and his .389 (49x126) mark set in the 1986 season... underwent successful left hand surgery to remove the hook of the hamate bone on March 28...the procedure was performed by Dr. Thomas Mehlhoff at Texas Orthopedic Hospital...began the season on the Restricted List and served a five-game suspension...placed on the 10-day DL on April 3...activated from the DL on April 13... placed on the Paternity List on June 28 and was activated on July 1...went 4x5 with a double and two RBI on May 4 at ARI, tying his single-game career-high for hits...posted a 12-game hitting streak from May 24-June 6...matched his single-game career high in hits on June 10 at TEX, going 4x5 with a homer and two RBI...hit his second-career grand slam on June 24 vs. KC...led off the 2nd inning with a double before hitting a grand slam later in the inning, becoming the first Astros player with two hits, including a grand slam, in the same inning since George Springer on June 24, 2016 at KC...batted .330 (31x94) with three homers and 21 RBI in June, ranking tied for sixth in the AL in RBI during the month...recorded his first-career walkoff hit on July 5 vs. CWS, an RBI-single in the bottom of the 9th inning...posted a career-long 13-game hitting streak from July 3-20...hit his 80th career double on Sept. 17 vs. SEA in what was his 300th career game in the Majors...the 80 doubles marked the most by a Cuban-born player within his first 300 career games in the Major Leagues... went 3x4 with two homers and seven RBI on Sept. 21 vs. LAA... was his first-career multi-homer game...hit his third-career grand slam, and second of the season...set a career-high in RBI, which were also a new Minute Maid Park record...marked the most RBI by an Astro since J.R. Towles recorded a club-record eight RBI on Sept. 20, 2007 at STL...also tied a club record for RBI by a first baseman, a mark Jeff Bagwell reached twice (July 7, 2001 at KC, Aug. 13, 2000 at PHI)...his 81 RBI are a new career-high...on Sept. 21, he and his brother Lourdes Gurriel Jr. became the first set of brothers to record multiple homers on the same day in MLB history (Elias Sports Bureau)...became the fourth pair of brothers ever to combine for four homers on the same day (STATS, Inc.)...also Cal Ripken Jr. (3HR) and Billy Ripken (1HR) on May 28, 1996, Dom DiMaggio (1HR) and Joe DiMaggio (3HR) on June 20, 1948, and Bob Meusel (1HR) and Irish Meusel (3HR) on July 1, 1925...was named AL Player of the Week for the week of Sept. 16-23...during the week, hit .433 (13x30) with three doubles, three homers, 10 RBI and a 1.267 OPS (.433 OBP/.833 SLG) in seven games, five of which were Astros victories... among American League players during the week, ranked first in RBI, tied for first in hits and tied for second in both runs scored (8) and total bases (25)...was his first-career weekly award...finished the three-game series against the Angels from Sept. 21-23 with 10 RBI, falling one RBI short of the franchise record for RBI in a single three-game series... played in five games on a rehab assignment with Double A Corpus Christi in April, batting .429 (9x21) with four doubles and three RBI...posted his second 13-game hitting streak of the season from Sept. 14-29...the 13-game streaks were the longest by an Astros player in 2018...recorded multiple hits in six straight games from Sept. 19-25...hit .226 (7x31) with two doubles, one homer and three RBI in eight postseason games...hit a three-run homer in Game 1 of the ALCS at BOS...doubled in Game 5 of the ALCS vs. BOS...was his 13th-career extra-base hit in the postseason, surpassing Hall of Famer Tony Perez for the most by a Cuban-born player in MLB history... was his ninth-career postseason double, tying Craig Biggio for the second-most in club history behind George Springer (11)...played in five games with Double A Corpus Christi on an injury rehab assignment (April 5-10), batting .429 (9x21) with four doubles .and three RBI. Had a spectacular first full season in the Major Leagues as a 33-year-old rookie...was still considered a rookie because he recorded 130 at-bats in 2016, falling one at-bat shy of exceeding the MLB rookie threshold... set franchise rookie records for doubles (43), total bases (257), extra-base hits (62) and slugging percentage (.485)...broke the record for extra-base hits and doubles set by Hunter Pence (56 XBH, 30 doubles) in 2007, the record for total bases set by Joe Morgan (251) in 1965 and the record for slugging percentage set by Jeff Bagwell (.437) in 1991...led the Astros and all Major League rookies with 43 doubles, which also ranked tied for seventh in the AL...tied for the ninth-most doubles by a rookie in AL history, and the most by an AL rookie since Nomar Garciaparra hit 44 in 1997...led all Major League rookies in batting average, ranking second among AL rookies in extra-base hits (62) and hits (158), and third in runs (69) and OPS (.817)...finished seven RBI shy of the franchise rookie record set by Jeff Bagwell (82) in 1991...marked the second-most RBI ever hit by a rookie in club history...his .817 OPS was also the second-best mark by a rookie in club history behind Bagwell's 1991 season (.824)...struck out just 62 times in 564 plate appearances, giving him the fifth-lowest strikeout rate in the Majors (11%), and the third-lowest in the AL...was the lowest strikeout rate by an Astros rookie since Bill Doran posted a 10.7% mark in 1983...saw just 3.42 pitches per plate appearance, the lowest mark in the Major Leagues...per Statcast, had 204 batted balls reach an exit velocity above 95 miles per hour, the ninth-most in the Majors and the sixth-most in the AL behind Manny Machado (250), Jose Abreu (230), Robinson Canó (223), Mookie Betts (209) and Nelson Cruz (204)...hit above .300 in all but one month this year (May)...hit .329 in April, .309 in June, .304 in July, .323 in August and .319 in September...made 130 starts at first base and four starts at third base...hit 39 doubles as a first baseman, the fourth-highest single season total by a first baseman in club history...marked the most since Lance Berkman hit 46 doubles as a first baseman in 2008...made his first career Opening Day roster and start...started at first base on April 3 vs. SEA...at 32 years, 298 days old, became the oldest rookie in club history to make an Opening Day start...recorded a career-high three hits on April 11 at SEA...hit the first grand slam of his career in a 2x4 performance on May 15 at MIA...set a career-high with four RBI...marked the first time in club history that the Astros hit grand slams in consecutive games...posted an 11- game hitting streak from May 28-June 11, the longest streak of his career and the longest by an Astros rookie since George Springer had an 11-game streak in 2014...recorded 24 doubles prior to the All-Star Break, the most in club history by a rookie...the last rookies to record 24 doubles prior to the All-Star Break were Geovany Soto and Daniel Murphy in 2008...recorded three hits in three straight games from July 1-4...also recorded multiple extra-base hits and multiple RBI in each of those three games, becoming the first player in club history with a three-game streak of multiple extra-base hits and multiple RBI...hit a two-run, two-out go-ahead double off his fellow countryman LHP Aroldis Chapman on July 1 vs. NYY that propelled Houston to a 7-6 win...set a career-high for hits on July 21 at BAL, going 4x5 with a homer and two RBI...per Elias, became the oldest player to record his first four-hit game in the Majors since John Jaso hit for the cycle on Sept. 28, 2016 at 33 years old...was named the AL Rookie of the Month for July after batting .304 with nine doubles, five homers, 20 RBI and an .899 OPS...led all AL rookies in hits (28), doubles, RBI, slugging percentage (.565) and OPS...tied Lance Berkman (2000) for the franchise record for doubles in a single month of July by a rookie...hit .304 (21x69) with seven doubles, one triple, two homers, eight RBI and an .864 OPS in 18 postseason games...21 hits marked the second-most in Major League history for a rookie in a single postseason...fell one hit shy of the MLB record set by Derek Jeter in 1996...set a Major League record for extra-base hits by a rookie in a single postseason with 10...surpassed Evan Longoria, who posted nine extra-base hits in 2008...set an MLB record for doubles by a rookie in a single postseason with 7, topping Dustin Pedroia (2007)...set a franchise record for doubles in a single postseason...only three players in MLB history recorded more doubles in a single postseason: David Freese (8 in 2011), Albert Pujols (8 in 2011) and Ben Zobrist (8 in 2015)...his 21 hits marked the most in Major League history by a Cuban-born player in a single postseason...batted .529 (9x17) in the ALDS vs. BOS...his nine hits in the ALDS marked the second-most hits by a rookie in a single Division Series in MLB history, behind only Ichiro Suzuki, who had 12 hits in the 2001 ALDS...became the first player in franchise history to record a hit in each of his first six postseason games...went 4x4 in Game 3 of the ALDS at BOS, tying a franchise record for hits in a postseason game...went 3x5 with a double and a triple in Game 4 of the ALDS at BOS...recorded a hit in six consecutive at-bats over Games 3-4 of the ALDS, setting a MLB postseason rookie record (Elias)...became the second player in club history to record at least three hits in consecutive postseason games, joining Craig Biggio (2004)...became the first player in club history with a double and a triple in a postseason game when he did so in Game 4 of the ALDS at BOS...became the fifth player in MLB history to record a double and a triple in a postseason game where his team clinched a series victory, joining A.J. Pollock (2017), Andre Ethier (2009), Frankie Crosetti (1938) and Lou Gehrig (1937)...hit a three-run bases-loaded double in Game 4 of the ALCS at NYY...was the first three-run double in the ALCS since Tulowitzki's in Game 5 of the 2015 ALCS...homered in Game 3 of the World Series, becoming the first rookie in club history to homer in a World Series game...was his first career postseason homer...became the second rookie in MLB history to hit a homer and a double in a World Series game, joining Tom Tresh (1962 WS Game 5)...received a five-game suspension from MLB following Game 3 of the World Series...will serve the suspension to start the 2018 season...hit a game-tying, three-run homer off LHP Clayton Kershaw in Game 5 of the World Series...joined Tony Perez (1975) as the only Cubanborn players to have multiple homers in a single World Series...became the eighth rookie in MLB history to hit multiple homers in a single World Series, joining Charlie Keller (1939), Michael Conforto (2015), Andruw Jones (1996), Willie McGee (1982), Reggie Smith (1967), Tony Kubek (1957) and Jim Gilliam (1953). Made his debut in the Majors after a long and successful career in Cuba's Serie Nacional...recorded 34 hits in 36 games with seven doubles, three homers and 15 RBI...made 20 starts at third base, seven starts at designated hitter, four starts at first base and one start in left field...after signing with the Astros on July 16, made four stops in the Astros minor league system: Gulf Coast League, Lancaster (A), Corpus Christi (AA) and Fresno (AAA), respectively...was recalled to the Major League club on Aug. 21, where he remained through the season...made his Major League debut on Aug. 21 at BAL, going 1x2 with a walk as DH... at 32 years and 73 days, became the third-oldest position player to make his Major League debut with the Astros, behind Pidge Browne (33.023) and Alan Zinter (34.030)...joined Dae-ho Lee as the only players in the Majors this season to debut at 32-or-older (Lee was 33.288 y/o with Seattle)...went 2x3 with two doubles and two RBI on Aug. 27 vs. TB...were his first career extra-base hits and RBI...became the first Astros player to record a game with at least two doubles and two RBI within his first five Major League games...hit his first career homer on Sept. 7 at CLE...also homered the following day on Sept. 8 at CLE...was batting .344 over his first 19 games in the Majors (through Sept. 12)...was the highest by an Astro over his first 19 games in the Majors (with an AB) since Hunter Pence hit .356 (26x73) in 2007...had a nine-game hitting streak from Sept. 4-12...batted .361 (13x36) with a double, three homers and six RBI in that span...in 15 overall games during his minor league stint (all four levels combined), hit .250 (14x56) with four doubles, two HR and 14 RBI with starts at third base, left field, and designated hitter. In his final foreign season, recorded an incredible .500 (87x174) batting average with 20 doubles, 15 homers, 51 RBI and a 1.463 OPS (.589 OBP/.874 SLG) in 49 games for Industriales in Cuba's Series Nacional...led the league in batting average, on-base and slugging, while ranking in the top 10 in doubles, runs scored and home runs. Was given a rare permission to play abroad by Cuban authorities and joined the Yokohama DeNA BayStars in Japan's Central League...hit a solid .305 (73x239) with 22 doubles and 11 homers in 62 games for Yokohama but after only one season in Japan, he returned to Cuba to recuperate from an injury...in what was his first time playing in a league outside of Cuba, ranked fifth in Japan in slugging (.536)...would join Industriales in Cuba for 49 games and hit .343 (60x175) with 18 doubles, seven home runs and 35 RBI...finished fourth in the league in OPS (1.009) and fifth in slugging (.577). After playing 12 seasons for Sancti Spiritus, joined Industriales, playing 81 games, while hitting .313 (93x297) with 21 doubles, 16 home runs and 69 RBI... led the league in home runs and slugging (.566), while ranking tied for first in RBI, second in runs (63), third in OPS (.991), seventh in doubles and eighth in hits and walks (54). Played his 12th and final season with Sancti Spiritus and hit .325 (91x280) with 18 doubles and 52 RBI in 79 games. Ranked sixth in the league in slugging (.586) and seventh in OPS (1.020)...two of the five players that finished ahead of him in slugging became Major Leaguers in Jose Abreu (.837) and Hector Olivera (.626). Finished tied for sixth in the Series Nacional in RBI, trailing current Big Leaguers Yoenis Cespedes (99) and Jose Abrea (93). Rotated between second base and third base in the 2009 World Baseball Classic, when Cuba failed to make the finals in a global baseball event for the first time in 58 years...hit .333 with two homers, five runs and six RBI in a solid six games... in regular season play, led Sancti Spiritus to a division title and had one of his best professional seasons, hitting .363 (125x344) with career highs in home runs (30) and RBI (105)...led the league in RBI and finished tied for second in homers. Hit .229 in the 2008 Olympics as Cuba won the Silver medal...in regular season play, hit .399 with 22 home runs, 90 RBI and 77 runs in 84 games...ranked among the league leaders in hits (131, 2nd), triples (7, tied for 4th), homers (7th), total bases (233, 2nd), RBI (90, 2nd), average (2nd) and slugging (.710, 2nd)...was named the League's All-Star third baseman and shared Gold Glove honors. Hit .278 as Cuba's No. 3 hitter and third baseman in the 2007 Pan-American Games...hit one of the three homers for the Gold Medal winners...batted .275 in the 2007 Baseball World Cup as Cuba won the Silver Medal...in regular season play, hit .302, with 68 runs scored and 71 RBI in 79 games...ranked tied for 5th in the league in home runs (22), tied for 6th in RBI and was second in sacrifice flies (7)...was named to the Serie Nacional All-Star team at third base. Was the star of the Cuban National Team which lost in the final of the 2006 World Baseball Classic... also played in the 2006 Central American and Caribbean Games, in which he hit .300 and led the tourney with nine runs in seven games while driving in seven...hit .389 in the 2006 Intercontinental Cup with 10 runs and eight RBI in nine games...in the 2006 qualifiers for the 2008 Olympics, hit .314 with four HR and 12 RBI in nine games...earned his second consecutive Serie Nacional MVP Award after hitting .345 (120x348) with 28 doubles, 13 homers and 46 RBI in 88 games. Led the 2005 Baseball World Cup with eight homers and was second with 19 RBI en route to being named to the All-Tournament Team...hit .319 with 12 runs in 11 games...outpaced Joey Votto, who finished second in home runs, three behind Gurriel...won his first Serie Nacional MVP Award after hitting .291 (95x326) with 13 doubles, nine home runs and 60 RBI in 89 games as a 21-year-old. Was a member of the Gold Medal Winning Cuban team at the 2004 Olympics. 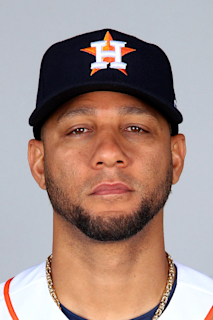 In the 2003 Baseball World Cup, Gurriel hit .358 with five doubles, three homers, nine runs and 13 RBI in nine games to help Cuba win the title...was error-free in 23 chances at second base...in regular-season play, hit .358 (77x215) with 42 RBI...finished second in the league in slugging (.614) and seventh in batting average. Played for Cuba in the 2002 Intercontinental Cup and 0x3 with a run...was just beginning his career in Cuba, as he played his regular season at the age of 18. Debuted for Sancti Spiritus at the age of 17 and hit .300 (106x353) with 26 doubles and 50 RBI. July 1, 2018 Houston Astros activated 1B Yuli Gurriel from the paternity list. June 28, 2018 Houston Astros placed 1B Yuli Gurriel on the paternity list. April 13, 2018 Houston Astros activated 1B Yuli Gurriel from the 10-day disabled list. April 5, 2018 Houston Astros sent 1B Yuli Gurriel on a rehab assignment to Corpus Christi Hooks. April 3, 2018 Houston Astros placed 1B Yuli Gurriel on the 10-day disabled list. Left hand surgery. March 29, 2018 Houston Astros placed 1B Yuli Gurriel on the restricted list. August 21, 2016 Houston Astros recalled 1B Yuli Gurriel from Fresno Grizzlies. August 16, 2016 2B Yulieski Gurriel assigned to Fresno Grizzlies from Corpus Christi Hooks. August 8, 2016 2B Yulieski Gurriel assigned to Corpus Christi Hooks from Lancaster JetHawks. August 2, 2016 2B Yulieski Gurriel assigned to Lancaster JetHawks from GCL Astros. July 16, 2016 Houston Astros signed free agent 2B Yulieski Gurriel. July 16, 2016 Houston Astros optioned 2B Yulieski Gurriel to GCL Astros. January 22, 2016 2B Yulieski Gourriel assigned to Cuba. February 1, 2015 2B Yulieski Gourriel assigned to Cuba.